I eat salads often — especially for lunch. And since they’re always a part of my meal rotation, I’m constantly thinking about different ways to prepare them. You know — keep it interesting. So last week, when I made that Sweet and Spicy Hash, I had some of the potato mixture left over. Naturally I decided to throw it on top of some greens, top it with balsamic vinaigrette and call it a day. But wait — it was good! Really good. So this week, I decided to replicate that idea (with some enhancements, of course) for lunches throughout the week. Here’s how I did it. Place sweet potatoes and onion on a large baking sheet. Add olive oil, salt and pepper; toss to combine. Roast, stirring occasionally, until potatoes are cooked through and slightly browned; approximately 20 – 25 minutes. Set aside to cool slightly. Top salad greens with potato and onion mixture, black beans, crumbled gorgonzola and balsamic vinaigrette. Finish with a few grinds of freshly cracked black pepper. Note: Potato and onion mixture makes enough for about 4 meal-sized salads. This looks like a great salad! I love throwing things together, but it doesn’t always make for great recipes for the blog. But this one looks like it’s worth making again! What a brilliant and original salad – yummy. Hooray! I love salad! Especially the ones that you just throw together for yourself for the week — those almost always end up tasting delicious. I can’t wait for Spring, I can’t wait for Spring. Just looking at this colorful salad makes me crave it even more. Hubby and I definitely have to plan a trip to Chi soon. Maybe in the early Summer. I love walking…pretty much anywhere…in that glorious city, but especially by the beach. Hey, have you been to a taqueria called Allende? The best 3AM tacos! You’ve made me even more excited for summer! And no, I’ve never been there but will have to check it out. Thanks for the recco! Gorgeous looking salad. So colorful. I love almost anything topped with gorgonzola. Yum. Your “random” salad would be a hit on any lunch menu! Very inspiring! 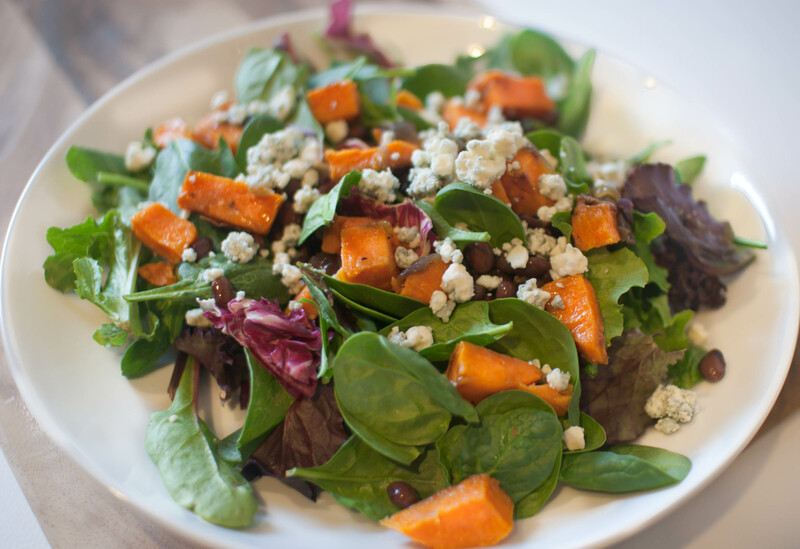 Sweet potato, black beans, Gorgonzola… What a great combination! Looks delicious! This is just the sort of dish I like to eat for lunch as well. Looks sensational!